Eclampsia, familiarly known as ‘milk fever’ or ‘puerperal hypocalcemia’ as its technical term, is a life-threatening disease commonly found in nursing female dogs weighing 25 pounds and below. The disease is due to the depletion of calcium levels in lactating dogs, usually with toy breeds or those having their first litters. Dogs with underactive parathyroid gland are susceptible to this disease since this gland regulates the parathyroid hormone which is responsible for regulating the calcium storage in the bones. When the mother starts lactating, the demand for calcium increases. The parathyroid gland, in turn, is unable to fill these needs for the body. As a result, the dog’s skeletal muscles suffer from tonoclonic contractions (i.e. tonic and clonic), whereby there is limited movement together with convulsing contractions. Breeds such as miniature poodles, chihuahuas, Shih-Tzus and miniature pinschers are highly susceptible to this disease. In most cases, the litter does not have to be large for the mother to develop eclampsia. 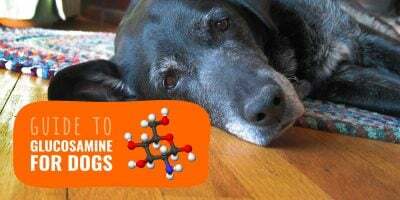 Since the body lacks the capability to move calcium into the milk from the blood, the condition has little to do with the puppies, and more to do with the underactive parathyroid gland. The good news, however, is that this also means the puppies are not affected by this disease as their calcium needs are being met. Eclampsia can lead to death. Thus, it is important to recognize the signs and symptoms of the disorder before it gets worse. Luckily, it is quite easy to recognize the signs on its onset. 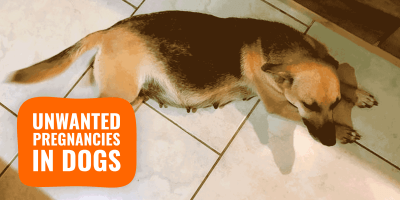 All these symptoms manifest because the dog lacked calcium supplementation while pregnant. It may also be due to the inappropriate ratio of phosphorous to calcium during pregnancy. At the same time, toy breeds are highly susceptible to this disease because their body weight usually can’t cope with feeding a large litter. First-time mothers are also at risk because their body has not adjusted to the sudden fast depletion of calcium content in their blood. Most significantly, poor nutrition during pregnancy puts the mother at a high risk of developing this disease (and many more deficiencies.) and lead to birthing or nursing issues. 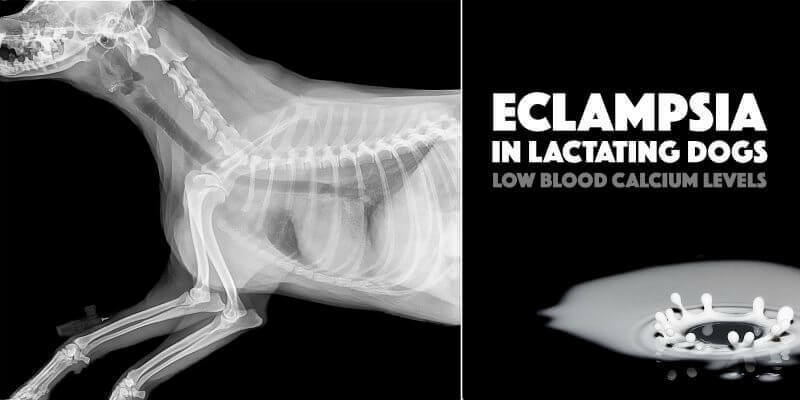 Eclampsia in dogs after whelping can be prevented using an adequate diet (calcium:phosphorus ratio of 1:2) and by avoiding too much supplementation in calcium. 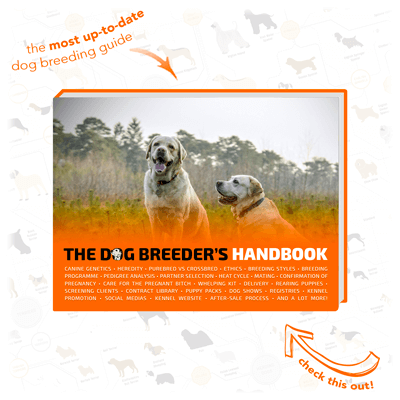 It is crucial for dog owners to monitor the new mother’s behavior in the first few weeks after giving birth. Initially, the signs and symptoms seem subtle without any cause for concern. However, if you notice the mother being restless or moving stiffly, you must contact your veterinarian to rule out any other possible serious problems or to stop the disease from progressing. Signs such as panting and restlessness may eventually progress to spasms throughout the body or convulsion. Some nursing dogs at this stage may get aggressive or disoriented with high fever; some may also neglect their whelps so you would be required to step in to rear the litter of puppies. Of course, prevention is better than cure. You want to monitor the dog’s health before the onset of the disease. This is why pregnancy supplements together with a healthy diet should be a priority even at the early stages of conception. This also means you have to take note of your dog’s health history leading to the first signs of symptoms if they do develop. 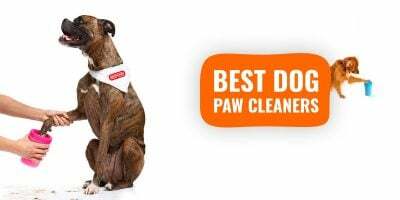 You also want to discuss in detail with your veterinarian about the health supplements and the diet you have given your dog before the signs start to occur. 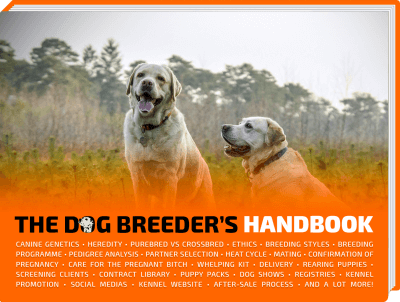 An accurate diagnosis will depend on your account of the dog’s health history. Standard tests including electrolyte panel, complete blood count, and chemical blood profile should be expected as well. The electrolyte panel will verify the total serum calcium in the blood. Concentration of below 7mg/dL confirms a dog’s eclampsia. Calcium supplementation should be given to the dog right away. Aside from low levels of calcium, most dogs may also suffer from low magnesium and sugar levels in the blood. Your veterinarian may also provide your dog with adequate supplementation to make up for these deficiencies. As much as possible, you want the disease to be evaluated and diagnosed as early as possible. Early detection and diagnosis may spell the difference between life and death for your dog. Eclampsia is a serious disease that should not be taken lightly. It is potentially life-threatening, but if detected early enough, it can be treated easily. Your dog’s health will stabilize sooner if the treatments are administered as soon as the onset of symptoms appears. Treatment may become complicated the longer you let the symptoms fester. Thus, different cases may require different treatment from the veterinarian. If the dog, for example, has a high fever, a fan and a cool water soak may be given to normalize the body’s temperature. Intravenous calcium will also be administered for as long as your dog’s calcium levels have reached a safe amount. At the same time, the dog’s calcium levels will be monitored after the calcium intravenous administration to ensure her body, on its own, is able to maintain the calcium levels it needs. Again, the treatment will depend on how complicated the situation has become. This is why early diagnosis is ideal. Another part of the treatment process is to stop the dog from nursing. This means the puppies have to be taken away from the mother and be hand fed until the mother’s calcium levels have stabilized. In some cases, dog owners opt to hand feed the puppies until they are able to eat solid food. If, however, you opt to allow the puppies to continue being nursed, you need to have constant checks with your veterinarian to ensure the dog’s calcium levels remain stable. After some time, some mothers are able to independently produce calcium, while others have to be given supplements for a longer period of time. The main point of the treatment is to ensure the dog’s calcium levels remain stable until she is capable of producing the element herself. Until then, she needs to get supplementation, orally or intravenously, to avoid the symptoms and the life-threatening issues from recurring. As the dog owner, you need to make the decision especially if the puppies are still dependent on their mother’s milk. At the same time, you also want to regulate calcium supplement intake because excessive calcium in the body may have an adverse effect on your dog’s health as well. 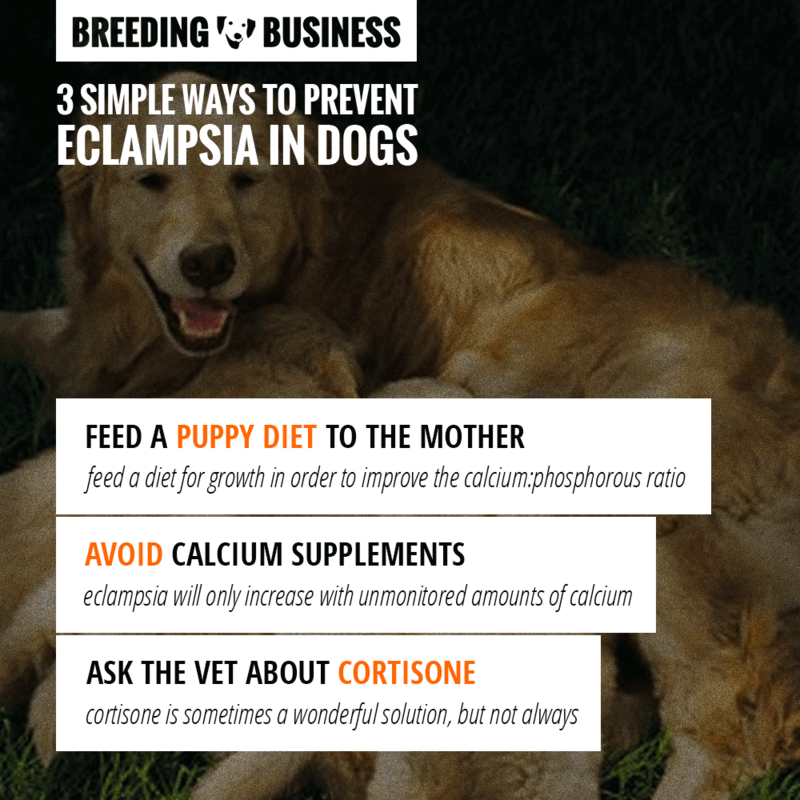 Should you decide to continue to nurse the puppies, you will have to continue providing calcium supplements throughout the duration of the nursing period. You also need to make sure you give her a diet with calcium to phosphorous ratio of 1:1 or 1:2. This ratio is ideal before and during the pregnancy. Giving her this diet will also stop eclampsia from happening when the next litter comes; although you may prefer to plainly stop breeding this particular female. Take note that calcium supplementation is not always advisable for pregnant dogs. Proceed with caution, or always seek advice from the veterinarian before you administer any supplements into your dog’s diet. At the same time, make sure you keep your dog away from high-phytate foods. This includes wheat germ, wheat bran, soybean, barley, and rice. These foods interfere with calcium absorption in the body. Thus, you want to keep your dog away from it as much as you can. 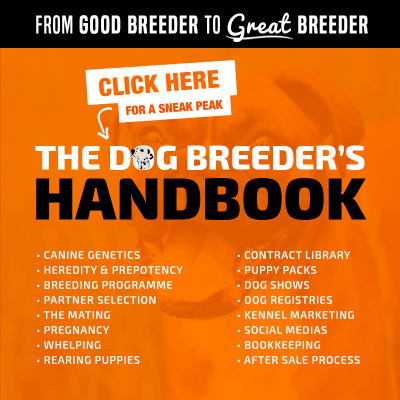 I believe the issue is that low levels of calciums shouldn’t be fixed/treated by the dog breeder himself through giving a lot of calcium supplementation. When doing so, it increases other problems (including ration calcium:phosphorous) and it is something people tend to naturally do. Also, IV calcium is different from dietary calcium obtained from supplements.